I'm familiar with Lauren Oliver's style of writing and I admit to being a huge fan of Before I Fall and a fan of the Delirium series so I already knew that her writing is beautiful and I had high hopes for Panic. The characters are the main reason that this book was so good. They're realistic and as a teenager myself I really connected with some of their concerns. Heather, one of the main characters, shows tremendous character development throughout the book. She starts off as a heartbroken girl that doesn't believe that she's lovable, so she joins Panic on a whim after her boyfriend breaks up with her. She grew up with a mother that drank too much and to her she doesn't seem to have a future outside of Carp. The one character that didn't work for me was Dodge. In my opinion, he comes off as sort of creepy. He's hell bent on revenge, so he plays Panic with the hope that he somehow fix what happened in the past. I get why he wants to do what he does, but at the same time I thought he was scary. He's also had a major crush on Nat and he royally messes that up with her by saying some things that would have been best kept to himself. I kind of understand his reasons for everything that he does, but I can't bring myself to like him. 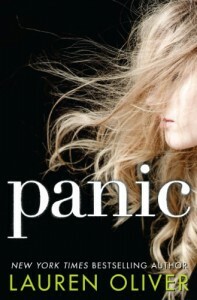 I really liked the idea of Panic. In some reviews I noticed that people were saying that it wasn't realistic, but I never thought that. I don't know if that's because there's an elimination game at my school that's played by the seniors for money, so the idea of a game like Panic wasn't all that foreign (of course the game at my school isn't nearly as intense as Panic). It was interesting to see each of the characters' motives for playing the game. I really liked the romance, especially when I wasn't sure what was going on with Bishop. Bishop is by far my favorite character from this book and I loved all the scenes with him and Heather because it was easy to tell that there is history between them and that they care about each other even though they don't admit it until much later in the book. I'm really looking forward to reading more books by Lauren Oliver in the future.